Food is one of the most popular ways for pet owners to treat their animals at Christmas. For many pet owners, buying a Christmas treat for their pet is part and parcel of the festive celebrations. But now a new survey by Mars Pet Care and Battersea Dogs and Cats Home has revealed the true extent to which the British public pampers its pooches at Christmas. 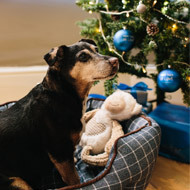 Some 498 UK dog owners were questioned in the survey, which revealed that 81 per cent will be buying their pet a Christmas present this December. Of these, 40 per cent said they were planning to spend more than £10.00 on their four-legged friend, with 24 per cent admitting to spending more than £20.00. But when it comes to cats, it appears that felines are not receiving the same treatment. The survey found that 17 per cent of cat owners who celebrate Christmas would not be spending more than £10 on their pet. This is compared to 31 per cent who claimed they would not be buying their cat anything at all. “The UK is renowned for being a nation of animal lovers, so it’s no surprise that people want to treat their pets at Christmas,” said Gosia Faras, corporate affairs director at Mars PetCare UK. “Pets really are part of the family, with 64 per cent of owners wanting to include their pet in their seasonal celebrations. The study found that one of the most popular ways for pet owners to treat their animals at Christmas is with food. Almost three-quarters of respondents (72 per cent) revealed they had given their dog turkey from their Christmas meal. The finding has prompted Battersea to publish a reminder to the public that certain ‘human foods’ pose a threat to their animals’ health. “Alcohol, chocolate, onions and some cheeses are all part of a long list of things that can be toxic for dogs and cats, along with raisins which we know are in many festive favourites like mince pies and Christmas cake,” said Battersea veterinary surgeon Claire Turner. Image (C) Battersea Dogs and Cats Home.